SUMMERTIME AND THE LIVING IS EASYâ¦. 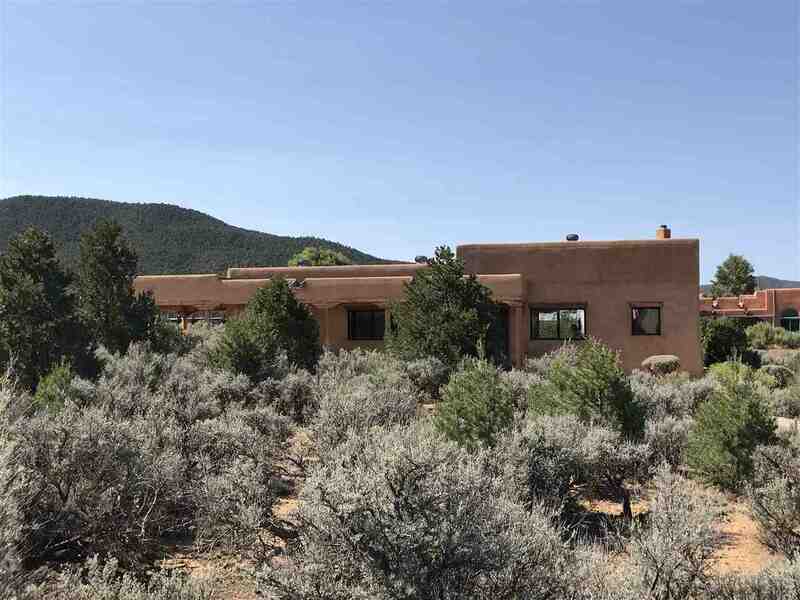 and wintertime is a pleasure too in this eco-friendly, people friendly 2BR/2BA/1CP home on 1 acre in the desirable Weimer area below the Taos foothills. Designed to be energy efficient with natural pumice-crete construction, trombe walls, passive solar gain, sub floor radiant heat, and on demand hot water, this well maintained single level home is perfect for anyone looking for easy, economical living. Lots of windows out- fitted with quality Hunter Douglas blinds bring the outdoors in with views in every direction. A corner kiva fireplace graces the living room and a smooth plaster finish is seen throughout. The mature xeriscaping will delight with lilacs, native pines, fruit trees, and flowers and all on drip irrigation. The location makes living easy too. It's near shopping, the hospital, medical services, restaurants, and town yet also near USFS. Skiing, golf, hiking, fishing, are all 15-40 min. away. Isn't it time to relax and enjoy life? Directions To Property: From Paseo Del Pueblo Sur, Go East On Paseo Del Canon (Bypass). Take Second Round-A-Bout Onto Weimer Rd. Turn R On Maestas. Left On Critcher (Past Este Es). House Is On Right, See Bhhs Sign. Circular Drive.